Dashwood Treated Timber & Posts Ltd. Since 1963 Dashwood Timber has been providing the Marlborough community with Timber, Posts and Preservative Treatment services. We have added Post Peeling, Sawmilling, Custom Machining (Weatherboard, Skirting, Tongue and Groove, Scotia), Firewood, Sawdust and Bark to our repetoire. Family owned and operated, Dashwood Timber is the place to come for all your Timber needs. 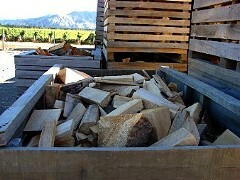 Update - April 2014: We have a variety of firewood available at present, Black Poplar Mill Slab, Split Gum, Macrocarpa and a small amount of pine. We're not offering delivery this season, but have a trailer which customers can borrow at no extra cost. Dashwood Timber sells firewood throughout the rest of the year too, including Pine, Black Poplar, Macrocarpa, and occasionally Gum. We assure your wood is as dry as possible by storing it long lengths, allowing the air to circulate around it. At the last minute, we cut it to firewood lengths, and put it into breathable crates for storage in a shed. Please ask if our current stock is dry! With a growing base of satisfied customers, you'll need to get in early to ensure your supply! Phone us today on 572 8168. We accept Eftpos, Debit Cards, Cheque or Cash, but not Credit Cards.